SAN FRANCISCO, Nov. 6, 2018 /PRNewswire/ -- HTC VIVEâ„¢ today announced a new premium update to Ready Player One: OASIS inspired by Steven Spielberg's blockbuster, "Ready Player One." With the Elite Gunter Pack DLC premium update, players will be able to experience additional hours of gameplay with new levels, environments, bosses and more. 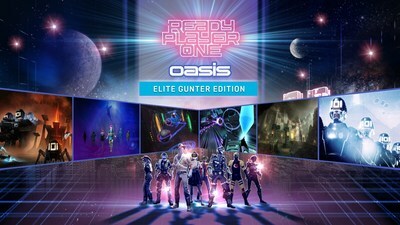 The Elite Gunter Pack DLC is now available for HTC Vive for $19.99 on Viveport and is also included as part of the Ready Player One: OASIS - Elite Gunter Edition in Viveport Subscription. "Ready Player One: OASIS has proven to be an extremely popular title that has resonated across the VR community," said Joel Breton, GM of Vive Studios. "Collaborating with some of our favorite developers, we've created a premium update that gives "Ready Player One" fans a deeper dive into this rich universe." "Ready Player One: OASIS is one of the most downloaded titles on Viveport," said Rikard Steiber, president of Viveport. "We're proud to be able to deliver this premium update to Viveport Subscribers at no additional cost to their monthly payment as they continue their adventure in the "Ready Player One" universe." From filmmaker Steven Spielberg comes the science fiction action adventure "Ready Player One," based on Ernest Cline's bestseller of the same name. Spielberg directed the film from a screenplay by Zak Penn and Ernest Cline. Donald De Line, Kristie Macosko Krieger, Spielberg and Dan Farah produced the film, with Adam Somner, Daniel Lupi, Chris deFaria and Bruce Berman serving as executive producers. The film stars Tye Sheridan, Olivia Cooke, Ben Mendelsohn, Lena Waithe, T.J. Miller, Philip Zhao, Win Morisaki, Hannah John-Kamen, with Simon Pegg and Mark Rylance. Warner Bros. Pictures and Amblin Entertainment present, in association with Village Roadshow Pictures, an Amblin Production, a De Line Pictures Production, a Steven Spielberg Film, "Ready Player One." Opening on Thursday, March 29, 2018 in 2D and 3D in select theatres and IMAX ®, the film will be distributed by Warner Bros. Pictures, a Warner Bros. Entertainment Company, and in select territories by Village Roadshow Pictures. This film has been rated PG-13.